The Urban Renewal period wall light in the urban school house style by Feiss. This collection re-creates period style fittings with a quality of old fashioned design, taking you back into history of times gone by. Bare bulbs in the 1920’s were being replaced with opal and glass diffusers and shades to create more of a reflected and even spread of light for pupils. This wall light is inlaid with antiquated mirror glass on the circular wall mount for a good overall light spread. The wall mount and lamp arm are finished in antique bronze. 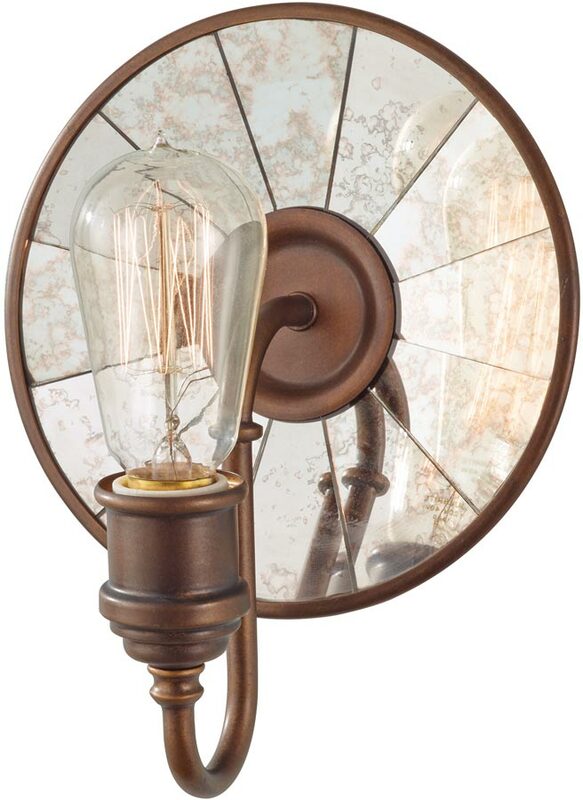 The perfect wall light for any room requiring a period style. Please note that the lamp shown is not included with this product but is available to purchase separately. Please see here for further information on this type of lamp. The Urban Renewal period wall light in the urban school house style, designed in the USA by Feiss, founded in New York in 1955. They have become well known over the years for their contemporary yet classic styling, quality and great original designs. Feiss continue to maintain the highest standards in materials and workmanship to this day.